Our VAC BMW Wheel Spacer Adapter kit for BMW 74mm wheel hub vehicles allows you to fit those awesome 3-series M-Parallels Wheels to your tricked out E39 5-Series. Freedom to choose... Your WHEELS! Are you eyeing those great 18" BBS wheels or the Factory M-Parallels you friend WANTS for their 3 series and are ready to One-Up them on your BMW E39 5-Series ?? Then this 74mm wheel hub adapter kit is for you! These 74mm Hub Adapter Wheel Spacers for your BMW E39 are machined in house at VAC Motorsports, after having been carefully designed in CAD/CAM for this very purpose: mounting most of the 5x120 lug, 72.5mm wheels on the market, on the larger bore BMW E39 74mm 5x120 wheel hub. We hear you already asking, how do I know if this kit will fit my car!? We designed these parts with that in mind. Using the "stock" wheel hub setup on the E39 and "stock" fender locations, these wheel hub converting spacers, paired with most* standard-offset wheels, will fit superbly! Not only will it give your E39 a wider stance, but look awesome as well. 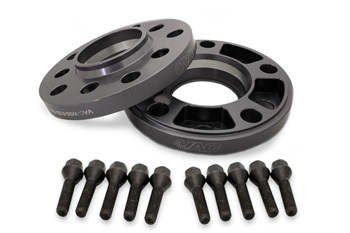 Now that you know you want them, why are VAC Motorsports BMW E39 18mm Hub Conversion Wheel Spacers the right choice? Tested for ZERO wobble- confirmed at close to 200MPH! These hub converting spacers have an integrated wheel 72.5mm hub.